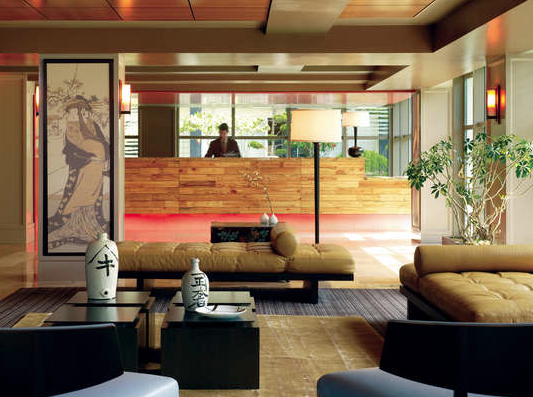 The lobby of the Hotel Kabuki in San Francisco Japantown. SAN FRANCISCO — Hotel Kabuki, a Joie de Vivre Hotel, has selected the San Francisco Japantown Foundation as its philanthropic partner. The foundation will receive funds raised through the hotel’s You Can Make a Difference program. Each hotel in the Joie de Vivre family of properties has a You Can Make a Difference program, which invites guests to donate $1 a night for the length of their stay toward the hotel’s local philanthropic partner, although they can opt out of the donation at checkout. One hundred percent of the funds raised through the Hotel Kabuki’s program will be donated to the Japantown Foundation. Joie de Vivre Hotels donates approximately $1.5 million annually to local organizations in the form of gift certificates, cash donations, in-kind donations, and events. In September, Henry joined the foundation’s board of directors, which includes board president Donald K. Tamaki, Hats Aizawa, Bob Hamaguchi, Richard Hashimoto, Mary Ishisaki, Keith Kamisugi, Diane Matsuda, Jon Osaki, Allen Okamoto, Jerry Ono, and June-Ko Nakagawa. The mission of the Japantown Foundation (http://japantownfoundation.org) is to support cultural, community and educational activities for San Francisco Japantown. It provides grants to not-for-profit organizations, groups and individuals conducting projects aligned with or further the foundation’s mission. The foundation was formed in December 2006 through generous endowments by Kintetsu Enterprises of America, Jack Hirose, Hats and Amey Aizawa, Union Bank, and Minami Tamaki LLP. Including its 2013 grants, the foundation has provided more than $635,000 in funding since 2007. Since its founding in San Francisco in 1987, Joie de Vivre has made curating authentically local and eclectic experiences its signature. Each one of Joie de Vivre’s more than 30 hotels is an original concept designed to reflect its location and engage the five senses. Today, the company manages the largest collection of boutique hotels and resorts in California and is expanding outside the state with hotels in Honolulu, Chicago and Scottsdale, Arizona. Joie de Vivre is a Commune Hotels & Resorts brand. For more information, visit www.jdvhotels.com.